My 4th time with the goddess!!! The 1% of a blogger's life is "cozying" to celebrities, and this is one of those days mehehehe (but well it's just 1% coz 99% of the time I'm a slave to my own backlog haha). Lemme also just say that in all my years of blogging, this is historically the first event held so near to our house!!! In like 3++ years of attending events!!! I always dread the traffic to and from events because Makati and BGC means 5 hours on the road overall, and 5 hours in traffic= dead Mari. 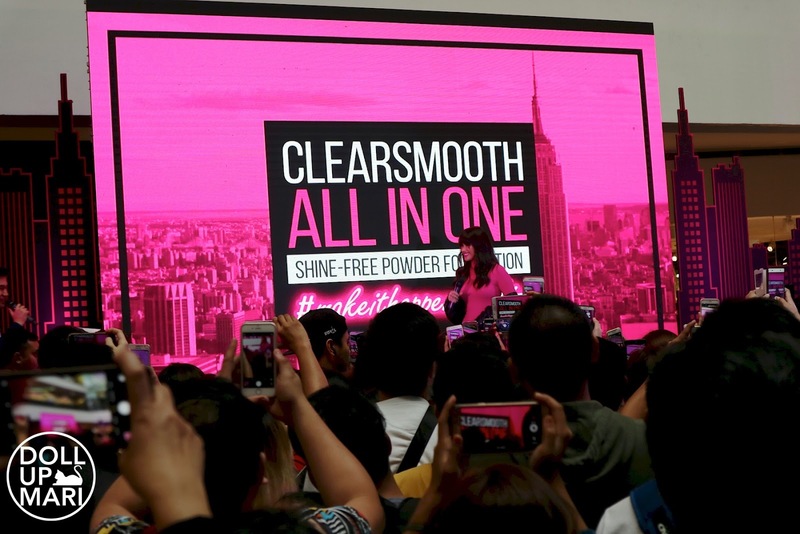 I heard Liza is a QC girl, too, so I think she liked that her event for Maybelline's Clear Smooth All In One Powder was held in the activity center of SM North EDSA The Block. 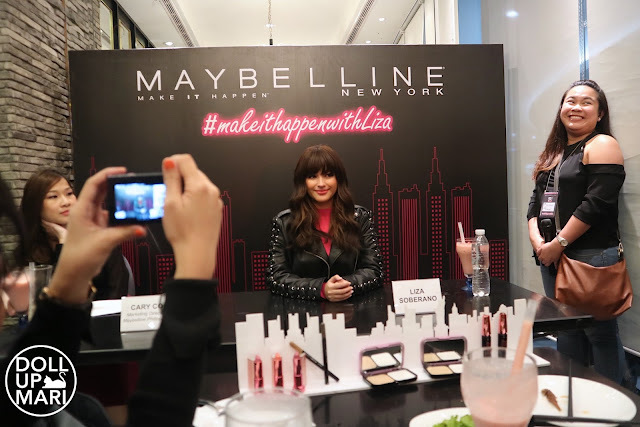 This event is also special as this is Liza's first consumer event with Maybelline. 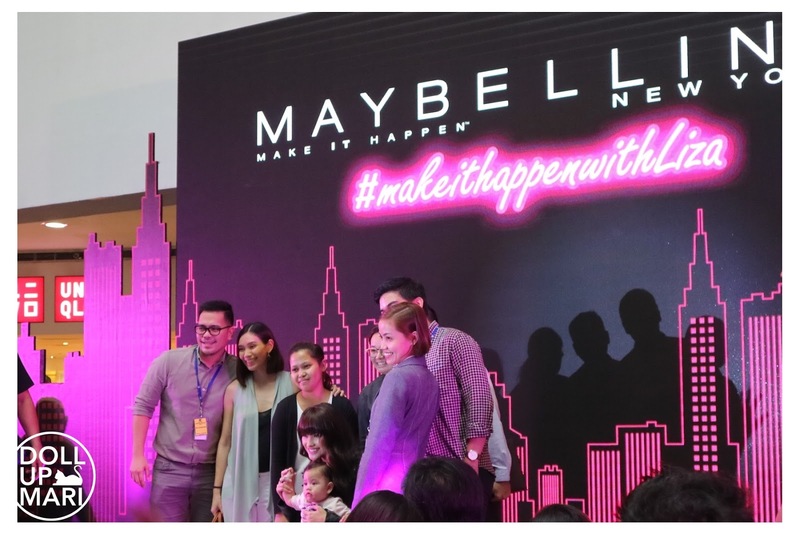 Since being launched as the new Maybelline girl last August, she has only done one press event thus far afaik, and the rest were digital activations. This is her first store activation, and fans were elated to see her. 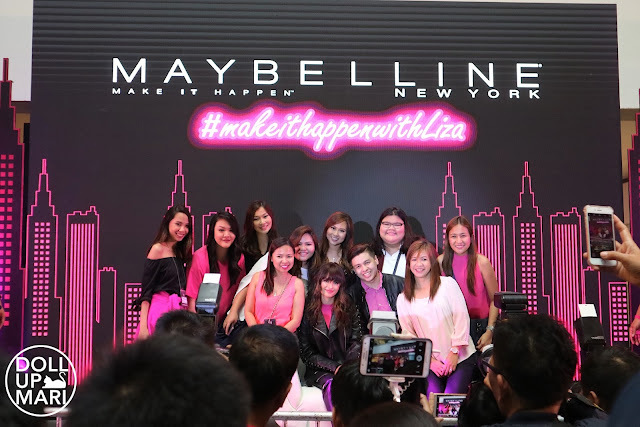 Fans of Liza were able to enjoy a comprehensive makeover and touchup courtesy of graduates of Maquillage Professionnel. I got my makeup touched up so many times in this booth! Of course every fan wants to look stellar when meeting Liza so this part is important. Today's event is all about Maybelline's Clear Smooth All in One Powder. 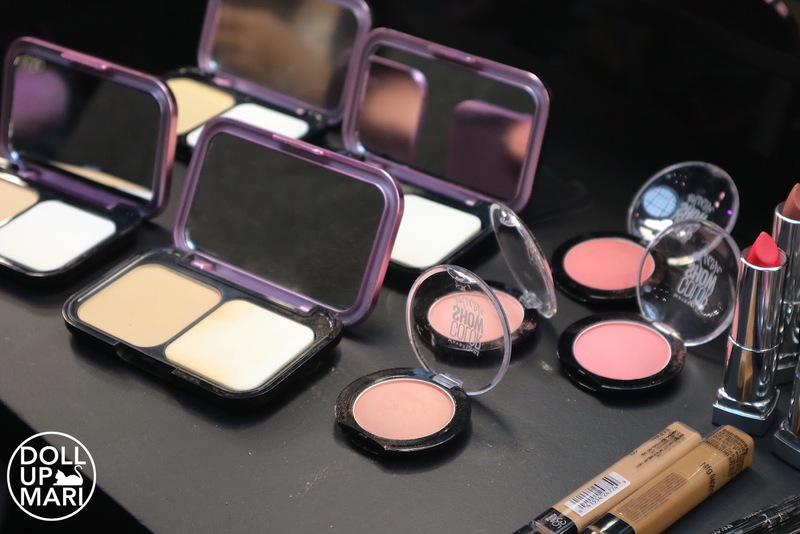 The Maybelline classic and go-to cult favorite of the nation went from being the nation's sweetheart to the nation's edgiest compact thanks to the new sleek metallic pink packaging. Now, the formula is 2x lighter so that you can be more empowered to be your most confident, naturally beautiful self. It's hard to be confident when you feel like your makeup is caking or heavy, so Maybelline heard your prayers with this one. Like before, all shades are Pinay friendly, and each Filipina can be her best self with 4 shades to choose from. Whether you're chinita, mestiza, or morena, there's a shade for you. 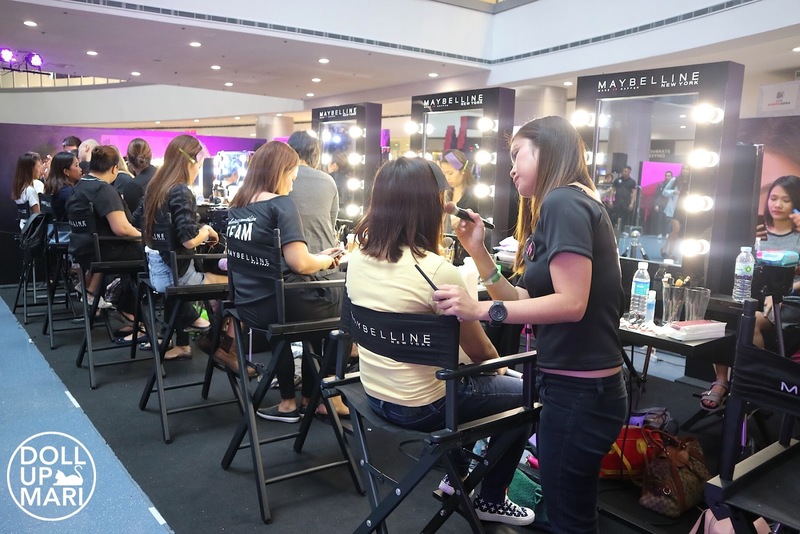 Simply ask your Maybelline beauty adviser for help in getting your shade. Once you do get your shade, y'all know this can be found in virtually every single store nationwide that sells personal care products so getting one is really easy. Refills are also easy because Maybelline does manufacture refills for this (they don't do it for all their powders so that's why this is worth mentioning). This is also the ultimate summer buddy as this is SPF 32! This is my favorite in the Maybelline family as this truly is lightweight compared to other Maybelline powders. I really do feel the difference with this one. This is one of the very few powders I can pile and pile and pile all day long without caking. Clear Smooth is very good against oil, and analogously, I personally feel that its cousin, White Superfresh, is good against sweat. Of course, a Maybelline booth was nearby so that customers can learn more about the products and make their qualifying purchases in order to get to the activity area. More importantly, the purchases were important to stand a chance in the raffle draw for a meet and greet opportunity with Liza. The deal was so sweet! Selected fans were able to have their photos taken with Liza with a professional photographer and printed out for them to keep forever. They'll also see themselves on the internet soon. 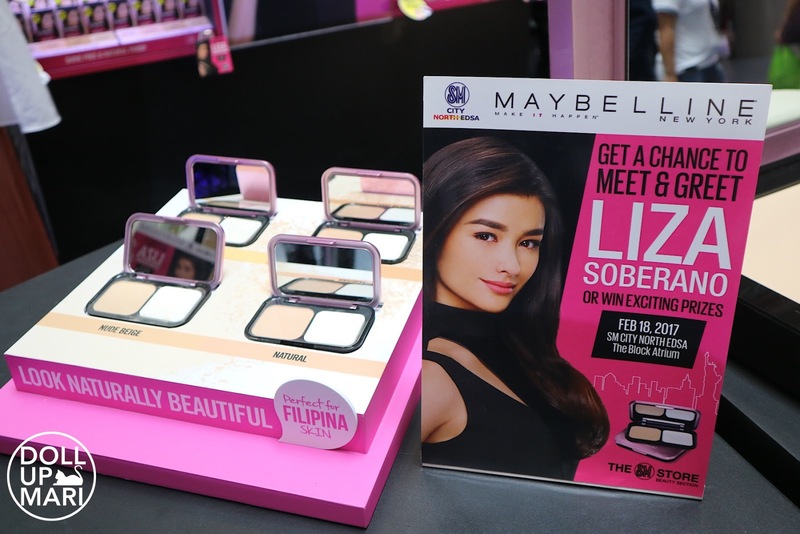 They also got showered with Mayebelline goodies and Liza Soberano themed Maybelline merchandise. 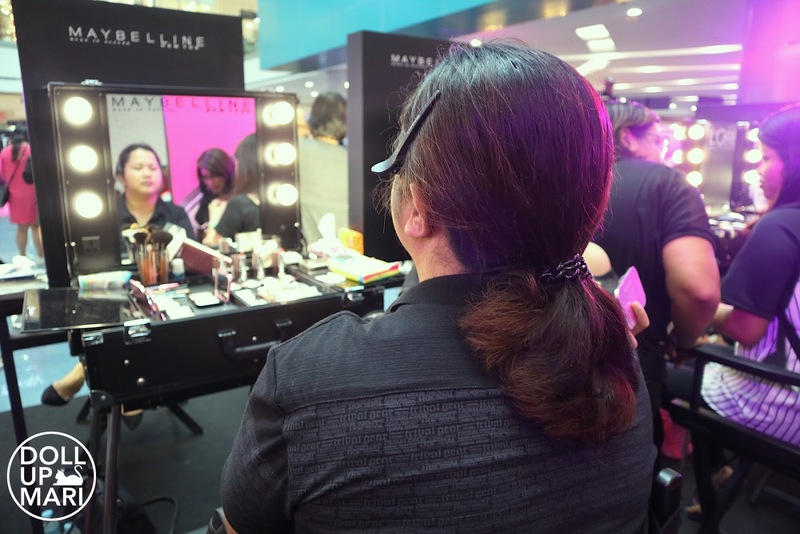 Aside from Clear Smooth, a lot of people were going crazy over the eyeliners as there was an eyeliner sale going on, and they also paid attention to the discount on Powder Mattes, Maybelline's newest lipstick line. Customers were browsing happily and stuff. I am sure no one was ready for what was gonna happen. Yeahp. This happened. "Incognito" (I added quotation marks because honestly I think most die hard fans like myself can recognize her immediately) Liza Soberano made a sales pitch to unsuspecting customers to buy Clear Smooth All In One Powder!!! Craaaay!!! 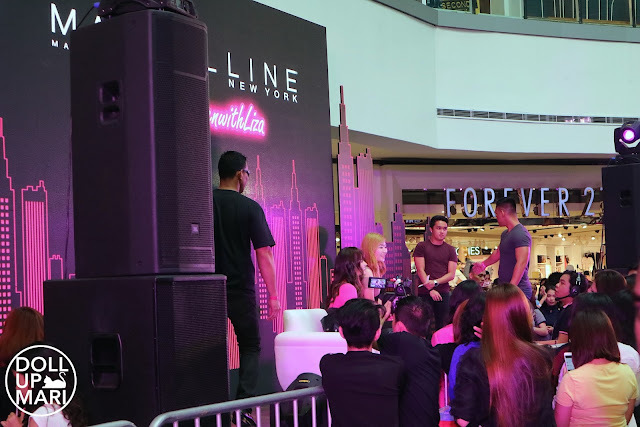 Fans around her were already going crazy, but the unsuspecting customers probably thought people were screaming because Liza was gonna go onstage. I personally have no idea how they could not know, but they really didn't just seem to know based from how they acted. I asked my friends after if these customers were actresses, but they really weren't. These were real customers who didn't suspect a thing. I guess they thought Maybelline hired a model today or something? Or Maybelline salesladies can now wear sunglasses? I regret not getting a word from these girls because I honestly am dying to know what was going through their heads that time. Liza was happy because a lot of people were surprised. Everybody got soooo excited when they saw her. I feel like some people were initially skeptical that she might not come, so some were hesitant to buy the purchase amount. But the moment she did this all their doubts flew out the window. They reallllly were so surprised. 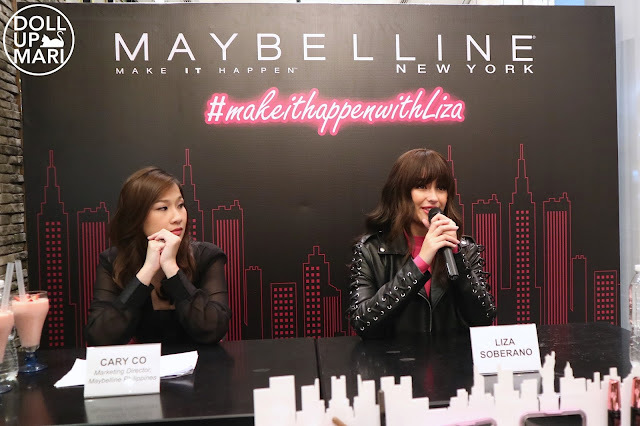 To those wondering how this idea came to be, Sandy (product manager for face) shared that Liza once went to a TriNoma Maybelline booth with a mask and heavy disguise. She brought a chaperone who was speaking and stuff, and Liza was just pointing to the merchandise she wanted to try or buy. She takes her Maybelline girl status very seriously, which is why she really wanted to know how people experience Maybelline in store. That's how this whole gimmick was born. I think this is the only decent photo I got to take of her gimmick! I was so excited and so scared at the same time because people were so excited that there was a lot of pushing. I really could not plant myself to the ground; it was sort of scary. That also meant all my shots are shaky thanks image stabilizer mehehehe l;xkdkljlkszjdlakd. Thankfully LizQuens are always civil, so while I was scared, I also knew people were peaceful enough that no stampede would ensue. Not long after the gimmick, Liza comes out onstage to render a song for everybody (she sings The Chainsmokers' "Don't Let Me Down"). I reaaally like that she takes singing seriously. I notice that there are teen stars, who, upon reaching the same level as her, no longer bother developing their talents anymore. They rest on their laurels, and plenty a times, horrify us with their still-horrible singing or cringe-worthy lip synching. The case is not true for Liza. She really sang well and was noticeably improving from past song numbers. She must be practicing often, getting coaching, or both. It shows. Plenty of fans were elated to get a glimpse of her holiness. And plenty of fans will go home with the honor of being able to see the goddess in real life. Liza is just so happy to see everybody. She is very thankful for the extreme success of her movie My Ex and Why's and is just so happy to be there. She shared that she was nervous and excited at the same time over her beauty adviser experience. She wasn't sure if she was gonna successfully make the pitch. The fun part is the meet and greet! Liza entertained each one of the 50 lucky fans who got the chance to be near her and have their photos taken with her. I think a lot of people went crazy when the safety manager (I think) put his son on her laps because I think people instantly thought that the child could perfectly pass as what her and Enrique's future children might look like (yes I'm part of the fandom too LizQuen forever walang kokontra cheret kemerut). Liza also happily posed with her Maybelline family consisting of the sales and marketing managers. Perhaps there were also operations managers in this photo? I'm not too sure will ask my friends. The only time I got to take decent photos of her was during the presscon!!! I honestly did not feel how much time was passing by because I was like 1.5 meters away from her Holiness and was contemplating how blessed I was to have had the opportunity of being in close proximity to her Holiness. Because it was a reaaal presscon, I was able to ask some questions! I asked her about what she had to say to the girls who are being makeup shamed. Y'all know people get makeup shamed so often nowadays. Liza said that she felt so sorry that that was happening. She wasn't even aware it was happening. Her answer is that people should be able to do what makes them happy, makeup included. 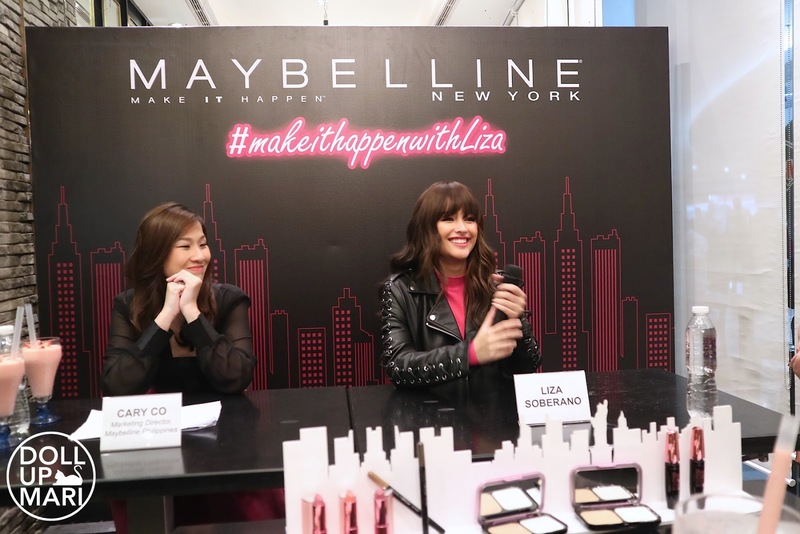 I asked her about a time when she wore a Maybelline product, and then Enrique saw her and said "Oh Liza, you look so blooming!" She initially took some time backtracking, but remembered perfectly that she wore Maybelline Creamy Mattes in Clay Crush to the Star Magic Ball and Enrique told her "You look beautiful." I asked her about what Maybelline lipstick would she wear to whatever victory party there may be given that My Ex and Why's earned 30M on its first day. Her answer is that Tito Mickey (her makeup artist) will always like to explore different looks for her. She said that she personally would factor in the theme of the party, the mood, the overall look, and then modify the lip look to play around to it. I then asked her that while people from newborns to centenarians love her, a bulk of her fans are very very young girls. 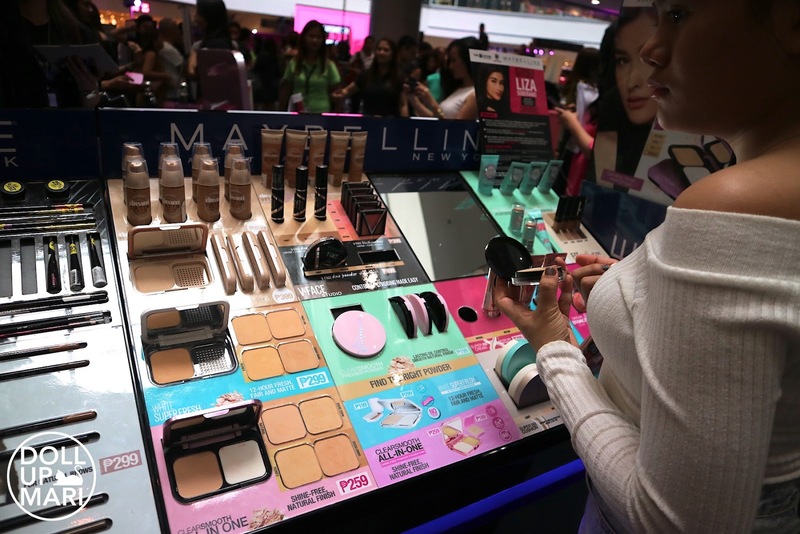 What Maybelline item would she recommend to very young girls (10-12y.o) as a fitting choice for their first makeup purchase? Her pick is Maybelline's Clear Smooth All In One powder. If not that, Baby Lips is also a good choice (and that her answer holds not just because of the word "Baby" in the products hahaha). She did share that there is indeed some pressure on her because she is associated with the word "Beautiful." She shared that she has her own share of insecurities, like her eyes which she thinks are uneven at times, and her figure, because being on TV really does make one look bigger. She's had some worries over her curvy hips, but also quipped that she just tries her best to eat healthy. She doesn't believe in starvation or fad dieting to get to one's desired figure. She was so excited upon finding out that she was a Maybelline girl, and almost cried when Tito Mickey revealed the information to her. She feels so honored to be in the same ranks as Gigi Hadid and Jourdan Dunn, and wishes that opportunity could afford her to meet the supermodels someday. The room lit up with revelations from Liza that she indeed is working on new LizQuen projects and will be back on TV soon. I am soooo exciteeeed!!! And yeah I just put so many photos of her from the same setup because her Holiness. And also because I think the photos themselves are good proof of how nice Clear Smooth All In One looks in photos. And just to let y'all know she's still the La Preza girl you all fell in love with. At the start of the presscon, I was wondering why she was glaring so hard at the desk. Turns out, she was eyeing a glass of strawberry shake, too. That's the glass beside her. Since the press con was so busy, they just put the drink in a take away cup. I hope she enjoyed her strawberries!!! I think the Lugang staff member assigned to make that milkshake brought great honor upon his/her family.. I think until now she still finds it so surreal that she's the Maybelline girl. You see it in these candid moments. It's like she can't believe she has her Maybelline event now. That her name is on the backdrop. So uhhh who knows? 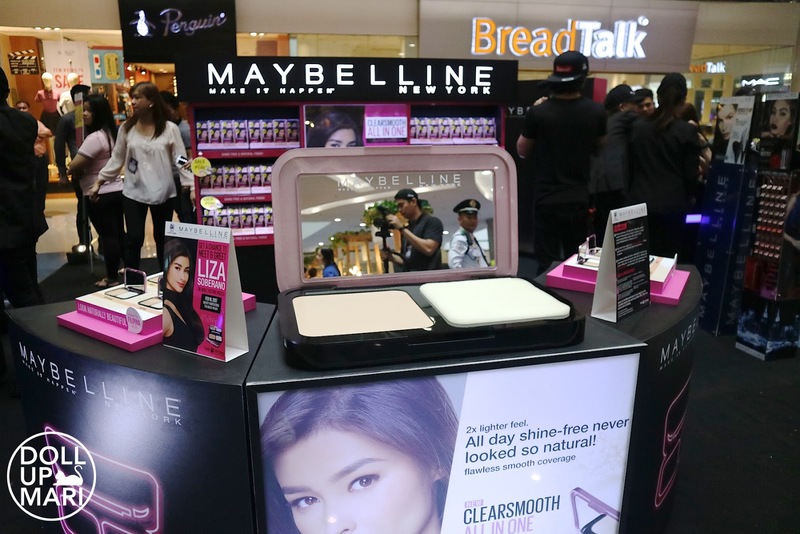 Liza might be going to Maybelline stalls near you incognito anytime soon? Be sure to be there when she does make a surprise! Last time na naka-attend ako ng event yung workshop kay Solen Heussaf, tapos late pa. Hahahaha! Nice one Maybelline.